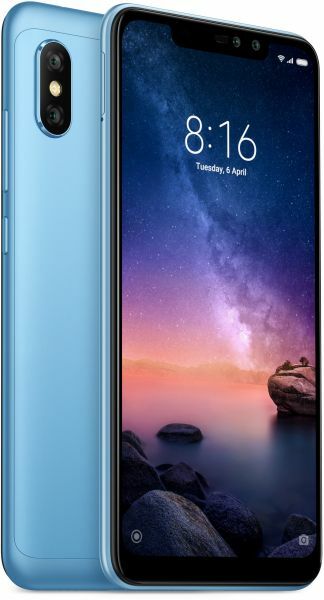 Click your favorite shots on the go with this Xiaomi Redmi Note 6 Pro Dual SIM mobile phone. It is designed from premium materials and looks eye-catching in its blue finish. This mobile phone features 12MP plus 5MP dual rear camera with dual pixel autofocus functionality for capturing extraordinary images on the go. Furthermore, it has a 20MP plus 2MP portrait dual selfie camera for clicking beautiful selfies, which you can post on the social media without thinking twice. This smartphone is powered by a high-performance Qualcomm SD636 Octa-Core processor that allows you to run the most demanding of apps and games, without any hassle. The 4GB RAM lets you effortlessly switch between various apps and games, ensuring you of a smooth multitasking experience. It features a gorgeously beautiful 6.26inch FHD plus screen that will keep your senses engaged in it all the time. This smartphone comes with 64GB memory that enables you to store all your favorite content, be it pictures, videos, or even full movies so that you can enjoy them on the go. The dual-SIM functionality of this mobile phone offers the perfect way of keeping your personal and private life separate. Superb phone, value for money. Excellent camera, screen display.